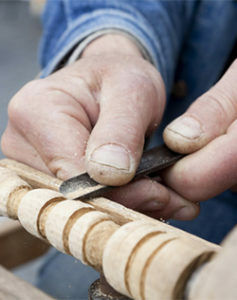 At Picus Woodwrights, we honor the honed skills and sensibilities of traditional craftsmen in every project – whether it is a full restoration of a 17th-century house, the renovation of a contemporary commercial property, or the reinvention of a kitchen or master bath space for improved functionality and aesthetics. Early American buildings are individual creations – and while they can be classified by when and how they were built, each is truly unique. Prior to the Industrial Revolution and the adoption of local building codes, a home was constructed according to the decisions of the builder, carpenters, homeowner, availability of materials and, at times, an architect. When that building is two hundred years old and in need of updating, restoration or maintenance, those decisions become the little, inscrutable “what ifs” that can turn a dream project into a nightmare. Every construction characteristic needs to be well considered before a hammer enters the house. At Picus Woodwrights, we look at each home we work on as a series of well-reasoned decisions that were made by experienced craftsmen. That awareness combines with our experience in antique, historic and well-considered contemporary homes and buildings to inform our perspective and guide how we counsel our clients. As a general contracting firm, we also manage projects. We perform the behind-the-scenes work that ensures projects stay on schedule and within budget, including obtaining permits, coordinating trade contractors, arranging for state and local inspections, and appearing before historic district commissions. Picus Woodwright, Inc is a registered and insured contracting firm in Rhode Island.